14K yellow gold,oval madeira Citrine and diamonds ring. A sparkling setting of gems sets off this remarkable style! Crafted from 14K yellow gold , this ring features one oval cut 8 x 6mm Madeira Citrine in a channel setting and two round full cut diamonds in beads settings. The ring is accented with a brush satin finish down the shoulders and hight polish finish the top. 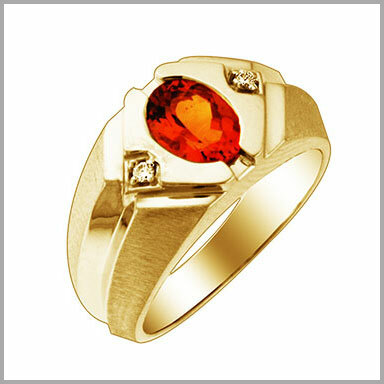 The total Madeira citrine weight is 1.1500ctw and total diamonds weight is 0.3000ctw (both approximate). This ring measures 11/16"L x 7/16"W x 3/8"H.